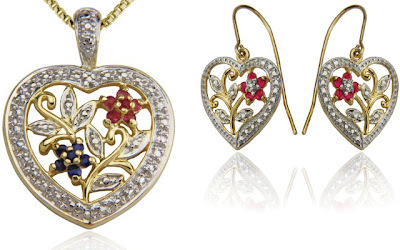 The 18k Yellow Gold Plated Sterling Silver Ruby and Diamond Accent Heart Earrings are currently selling for just $34.00 on Amazon.com! You will be saving 72% off the listed price of $119.99 with this jewelry deal. Also on sale is the matching 18k Yellow Gold Plated Ruby, Sapphire, and Diamond Accent Flowers Heart Pendant 18" Necklace for just $49.00! Either or both pieces would make great Mother's Day gift ideas.